What are the available configurations that can be made on HENNGE Secure Transfer? There are some changeable setting items those which the administrator can set up on the screen, and the others those which you can ask the HENNGE One support team to set up. Log in with administrator privilege, go to [Management] on the left menus -> [Domain Information]. Then, you can see a current setup values on [Domain Information] page. Click on [Domain settings] at the bottom of the page. On the [Domain Settings] page, modify setting value and save it. For settings which you can ask the HENNGE One support team to set up, please contact the HENNGE One Support Team. 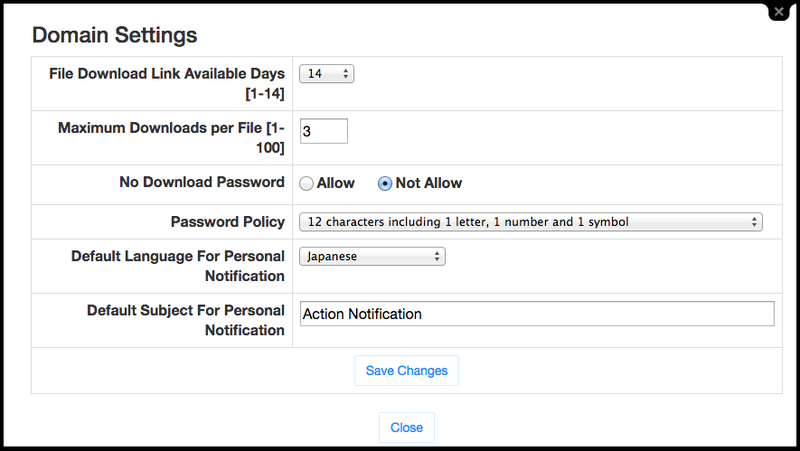 For further details, refer to the types of the preset password policies in the on-line storage service. If the user has already set up the text language and the title of the notification mail (=If the user has ever at least once achieved the setup process; i.e. going to [Setting] on the left menus -> clicking on [Save the change] under the tab [Personal Notifications) and if the user has ever received at least one notification mail, the user’s setting will take first priority.